Summit Series gas BBQ grills are the crown jewels of the Weber family, with exclusive features, the highest level of performance and stunning looks. The Weber Summit E-470 is beauty redefined, but it adds more than just style to your backyard. The porcelain-enameled E-470 features 4 stainless steel burners that produce 48,800 BTUs and a 10,600 BTU Sear Station, each with Snap-Jet individual burner ignition to help you get the party started as quickly as possible. The Summit E series propane gas grill comes fully equipped with 9mm (3/8 inch) stainless steel rod cooking grates and stainless steel Flavorizer bars to effectively hold and distribute heat evenly over the 468 square-inch main cooking grid. The warming rack provides an additional 112 square inches for a generous 580 square inches of total cooking area. Summit grills come equipped with a stainless steel grease tray with a catch pan to make clean-up as easy as possible. This Weber E-470 also has a 12,000 BTU flush-mounted side burner that lets you multi-task while grilling, a stainless steel smoker box with a dedicated 6,800 BTU smoker burner and a 10,600 BTU infrared rotisserie rear burner. The Tuck-Away rotisserie system features a flip-up motor and separate spit rod and fork storage inside the cart. This Weber Summit grill has a porcelain-enameled frame and lid and a front-mounted control panel with LED lighted control knobs and a backlit LED propane scale, which works in conjunction with the precision fuel gauge to let you know exactly where you stand on fuel at all times. The attractive black hood has a polished handle and trim and a center-mounted thermometer to monitor cooking temperatures. The grill cart features an enclosed storage area to keep your propane tank out of sight and four heavy-duty casters (2 locking and 2 swivel). The two stainless steel side shelves provide expansive prep space and the six convenient built-in tool hooks keep your BBQ tools nearby. Light up your grill with the Grill Out handle light, which features an integrated tilt sensor that automatically turns the light on when the lid is raised and off when the lid is closed. With the Weber Summit E-470, welcome to the top-of-the-line! Please note, the grill height dimension listed in the specifications are with the grill lid open. Please note this Weber grill cannot be converted to run on a different fuel type. Be careful when selecting the fuel type desired. Cooking Grid Dimensions 24 X 19 1/4"
Weber Summit gas grills are covered by a limited manufacturer warranty against defects in material & workmanship for a period of 10-years from the original date of purchase. Warranty excludes normal wear and is limited to the original purchaser. I have had my grill for 2.5 years, grilling 5+ times weekly. This grill is pricey but for the extreme griller, its worth it. It is packed with features that all work well. I cant say enough good things about my grill and have turned many friends into Weber customers. Keep up the great grills and keep them built in America! Bought this 5 years ago. Looks and works like the day I brought it home. Don't waste your money on anything else. Ya get what ya pay for. Easy grease removal. darn good grill, a very attractive. this product is great for the money, and quite attractive. the fact it provides real heat, a searing station, and a hide-away rotisserie, just adds to the wide range of capabilities this beautiful unit provides. This product is great. It is so easy to use. In the shipping process the BQ was damaged and the parts were sent right away. Very pleased with both the product and the service coordinated by ShoppersChoice. This is a great, all purpose grill. The grillable space is huge and the multiple burners allow for pretty good control of different temperature zones. I really like the storage for the rotisserie and that it comes with 2 sets of forks. Haven't had a chance to use it yet, nor the sear burner for the rotisserie, but will be trying it soon. One issue, this grill still flares pretty badly, especially on the sear burner. I did the annual gill cleaning this weekend. The gill is kept covered by a Weber cover and stored under an enclosed porch. I have rust on the both side trays( stainless) and all four handles and has the chrome bubbling. I am very disappointed in these two areas. As for the other construction, I am satisfied and it grills very well. I would have expected better quality parts by having the Weber name and the Weber price over it's competitors. The features that this grill has is wonderful and I do like it. It would have received a 5 star if not for these two problems. I bought this 6 years ago and it is kept covered and out of the weather. Have used it at least once a month in the winter and continuously in the spring and summer. This year all of the handles are rotting from behind the chrome and the hinges and sheet metal parts are crumbling. The Stainless is holding up well but not the metal and pewter parts. 10 year warranty but this is considered wear and tear. Which I understand. Friends and family have purchased the same with no problems, just my luck I suppose. I am a big weber fan. I had there 1st gen Genesis with the wood shelves. finally the burners and grates and wood were shot. Good service life. I bought a new Genesis and it started to rust and went thru a lot of grates. I moved and left it at the house and got a summit NG grill. the burners and grates and stainless steel stood up well. But the stand and fire box rusted real bad. Weber was good to deal with. Did nothing with the stand but sent a new firebox. Everything bolts to the firebox.. They sent no bolts screws and they were rusted bad as well. So I bought another Summit and was told they were made better. I also got another stainless steel (there not all stainless) the firebox has rusted quicker than the old one.. There great cooking grills but the porcelain cover steel is real bad on the fire box. This cart has stood up better but the service life is less than the last. The bad part is the firebox rots out where the valves go into the burner and you get fire out of the firebox in the valves area... I do not know what I am going to do. I would give it a 5 for cooking and being solid. Rust makes it a 1..
Weber Summit Gas Grills are Weber's top-of-the-line gas grill. 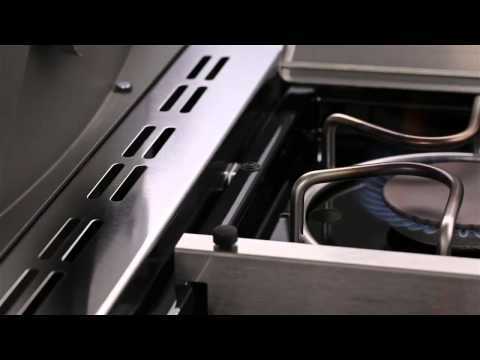 The Summit's cooking system (burners, flavorizer bars, and beefy cooking grids) are all stainless steel. Along with the durable cooking system, there are several convenient features not found on other Weber gas grills that separate the Summit as the best. The Weber Summit includes an attached Grill Out handle light that automatically illuminates your grill for easy nighttime cooking. I also really love the reliable start up using the Snap-Jet ignition since each different burner has its own flame throwing ignition. Another feature that takes convenience to the next level is the LED propane tank scale, which lets you know exactly where you stand on fuel at all times. For minimizing flare-ups, the Summit's Stainless Steel Flavorizer bars can be found directly above the burners. They shield the burners by catching drippings and turning them to smoke, adding flavor to your food. Weber pioneered the Flavorizer bar in 1984, and since then they've proven to do their job extremely well, which is why they're still preventing flare-ups on all Weber gas grills today! All Summit freestanding and grill center models include a 12,000 BTU side burner, which comes in handy if you need to warm up a side dish or a sauce. Additionally, when the side burner's lid is shut, it sits flush against its surface, which adds even more shelving space to the grill cart. The Summit 470 and 670 models include three additional features; a 10,600 BTU rear burner and rotisserie kit, a 10,600 BTU searing station for that extra high heat when you need it, and a 6,800 BTU wood chip smoker box with a dedicated burner. With over 50 years in business, Weber Grills customer service is as good as it gets. They have a 10 year warranty on the grill body and on the burners. They have reputable service and quickly handle any service or replacement part situations. The burner housing and the rear of the grill, even on the stainless steel models, are constructed of porcelain-enameled steel which is not as durable as other all stainless steel grills in the price range. You want Weber's top-of-the-line grill that's powered by an all stainless steel cooking system with practical features that make grilling a breeze. 24 X 19 1/4" 24 X 19 1/4" 26 1/4 X 19" 24 X 18"